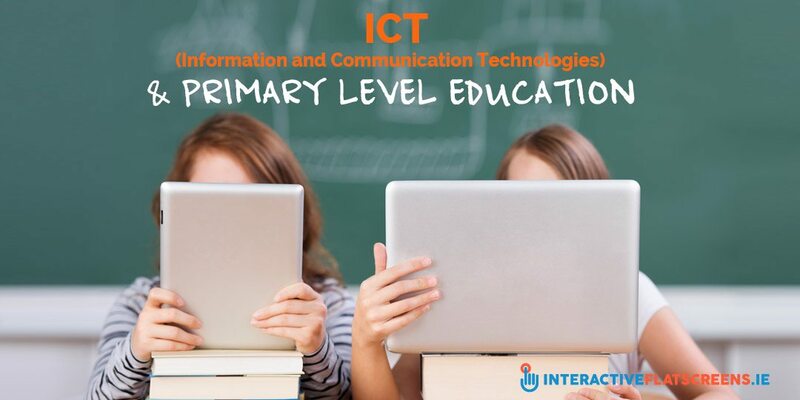 So how important is ICT & Primary Level Education and how does technology such as the interactive flat screens and the tablets facilitate it? There’s an old saying, ‘the child is father to the man’. Basically, this means what we learn in childhood determines our behaviour as adults. Our personalities are largely formed as children. A lot of psychologists would disagree with this but they can’t deny the importance of a good primary education. Next to their parents, the teacher is probably the most important person in a child’s life. This is a serious responsibility that any good teacher will readily acknowledge. In order to prepare pupils for the emerging world, IT skills are essential and what better way of learning IT skills than to learn through them? 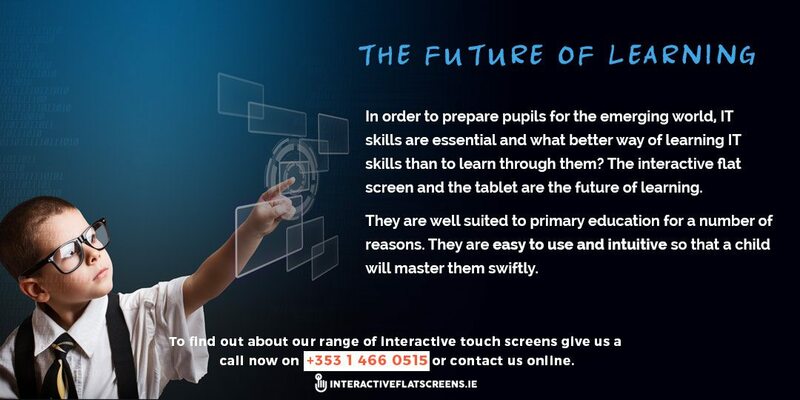 The interactive flat screen and the tablet are the future of learning. They are well suited to primary education for a number of reasons. They are easy to use and intuitive so that a child will master them swiftly. They can be used for games so that the child will associate learning with fun. This is an important principle in the education of children. And, because they are so powerful, they can speed up learning so that the teacher is freed up to engage with pupils individually. This will engender in the child trust in the teacher which will hopefully last throughout the child’s formal education and beyond. The class room of the future will be such a fun and enlightened environment. It’s important to get it right as our children will soon be running the world. A child’s mind is like a sponge. The educators of today have the responsibility of putting the right ideas into that mind. Through ICT this can be done with ease. Children are a lot more intelligent then we often give them credit for and they absorb things without seeming to. They can really surprise you. So, trust is a two way thing: the pupil must trust in the teacher’s good intentions and the teacher must trust in the pupil and their intelligence. The world is changing. The old system of pedagogy is being replaced, even at primary school level. Children are growing up fast. They know what they want to do with their lives at such a young age! Education is becoming more learner centred. At the forefront of these changing times are the interactive touch monitor and the tablet. They open up possibilities for engagement and interaction which will completely change the classroom dynamic. They will help to unlock the child’s potential but also the teacher’s potential as a facilitator of learning and as a guide. These are just some of the reasons why you should consider the interactive flat screen as an alternative to the white board. You owe it to your pupils and your teachers to provide the best in learning technology. Do so and you will start getting results almost instantly. 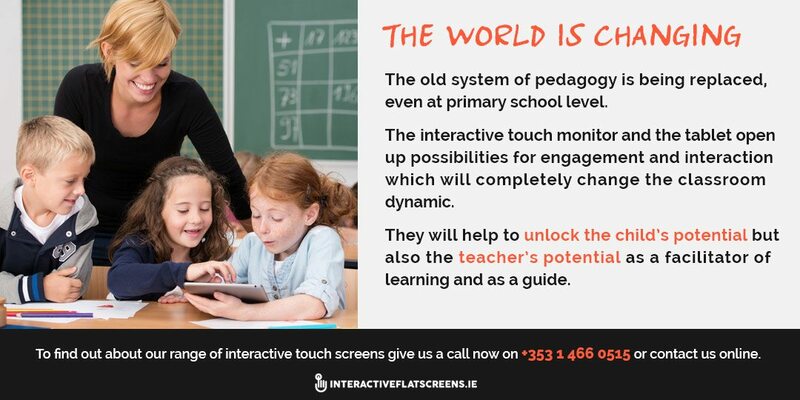 To find out about our range of interactive touch screens give us a call now on +353 1 466 0515 or contact us online.